This package is designed to address limitations which immediately impact your physical eyes, vision, energetic foresight, and the ways you see yourself. *Decreasing visual limitations due to witnessing events which cause trauma to the eyes. *Establishing consistent natural and supernatural abilities for eyesight. *Reducing atrophy within the muscles which control the eyes’ movements (extraocular muscles). *Removing calcification from the pineal gland. There are various subjects that you can bring forward as an intention for the eye activations. The most direct is using the activations for influence physical changes in the eyes, such as pursuing better eyesight or eye health. There are other matters which affect eyesight and vision which are not relatable in a direct manner. The following are suggestions for receiving the most out of your eye activations. These are not requirements, and you may find other suitable ways to apply these activations for your interests. As always, listen to your knowing and honor your intuition. *These activations may cause temporary eye sensitivity to air flow, light, and electronic screens. *If your eyes become tired or if you begin to experience headaches after these activations, please allow for periods of rest between replays. When in doubt, allow yourself at least one restful sleep cycle before playing the activations again. *These eye activations will release forms of trauma from physical, emotional, mental and unexpected events. This may result in unexpected emotional sensitivity, mental frustration, watering eyes, dry eyes, or other forms of release. Your present is an acknowledgement of your ongoing future. Are you staying in the present? Have you been rejecting your past? Have you been re-creating the past? Does your future seem ever elusive? When you frequently activate your eyes during this program, the scope of your present moment becomes wider and wider. During this 30 minute live session, we will cover ways to assimilate the present in order to generate an ongoing future which is full of exciting prospects. This is a live event which is scheduled to occur on Saturday, January 5th , 2018 at 10:30 am Mountain Time. This energy bath activation has a runtime of approximately 15 minutes and continues running for at least an hour afterwards. Oneness Is Everything Energy Baths are activated by Rann Goldrich in quantum space. Your energy bath is warm, ready, and waiting for you. 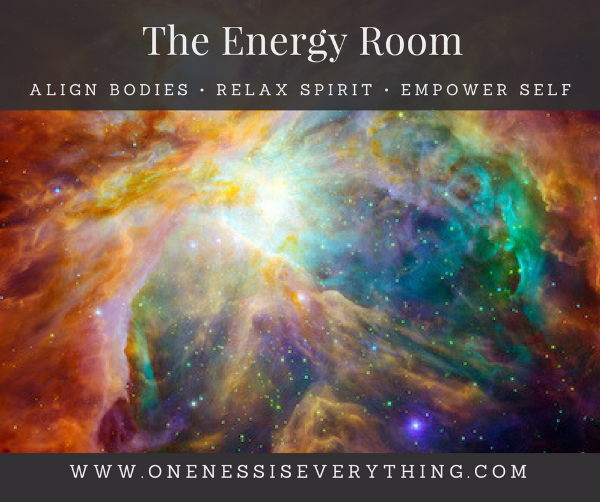 For a limited time, enjoy 24/7 access with an ability to download the most current Energy Room for $36 per month as long as your subscription lasts. (This subscription is usually $72 per month).